To celebrate Election Day 2018, we are doing our part to encourage the community to come together in a fun, non-partisan way to celebrate voting. We teamed up with Civic Nation’s #VoteTogether initiative to host a “Party at the Polls” in our own Burbank community. Community is the foundation of our work at Stratiscope, and we think this is a great opportunity to celebrate our voices as citizens and promote voting. 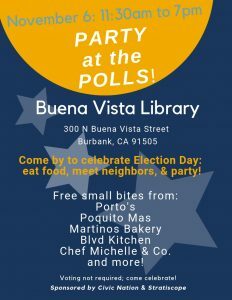 On November 6, 2018 from 11:30am to 7pm, we’ll be co-hosting a non-partisan party at the Buena Vista Library polling place – 300 N Buena Vista St, Burbank, CA 91505 – featuring food and activities for voters, families, and anyone else coming to celebrate our democracy. We’ll be featuring small bites and treats, activities for kids, and general celebratory environment all day, so come by to be apart of this community celebration of voting. Here’s our food schedule. Come at the indicated time to enjoy the treats while they last! We’ll also have activities for kids and adults alike. Make sure to swing by and “party at the polls” with us!